They came close but fell a goal shy of capturing their second straight weekend hockey tournament championship. 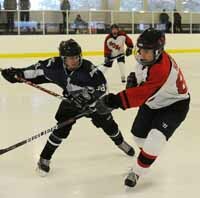 The Sun Valley Midgets high school hockey team had a 2-1 lead with five minutes left in Sunday's championship game at Sun Valley Skating Center. But arch rival Idaho Falls tallied a shorthanded goal for a 2-2 tie after regulation time and then outscored Sun Valley 2-0 in the shootout to carry home the title of the four-team Sun Valley Midget tournament. Sun Valley, winners of the Nov. 26-28 Turkey Shootout tourney at Salt Lake City, settled for second place with a 2-2-0 mark in its first home action of the 2010-11 hockey season. The young Suns of coaches Chris Benson and Ryan Enrico defeated the Boise Junior Steelheads 2-1 Saturday with Cooper Hanley scoring both goals. Then Idaho Falls clipped Sun Valley 4-2 later Saturday. Sunday, Sun Valley romped 6-2 over the Boise Hawks setting up its championship game meeting with Idaho Falls. The Eagles out-shot the Suns 25-14 in Sunday's title game but Sun Valley goalie Cody Levitan (23 saves, 76 weekend) kept the hopes of his team alive. Levitan even lent his extra goalie stick to the Idaho Falls netminder, who shattered his only stick during the second period. Sun Valley graduating senior Ian Murphy, his team's weekend-high scorer with three goals and three assists, tallied the first goal, unassisted, and Doug King made it 2-1 Suns assisted by Parker Weekes. In Saturday's debut against Boise Junior Steelheads, Hanley scored on assists by Tom Crosby (2) and Tony Martin. King and Mason Noyes got the goals assisted by Charlie Evans, Thomas Heinrich and Murphy in Saturday's first clash against Idaho Falls. Ian Murphy 3 goals/3 assists, Tom Crosby 1/3, Charlie Evans 2/2, Doug King 2/1, Parker Weekes 0/2, Mason Noyes 2/0, Cooper Hanley 2/0, Tony Martin 0/1, Thomas Heinrich 0/1, Cody Levitan 0/1 and Cam Jenner 0/1. Unsuccessful Sun Valley shooters in Sunday's shootout were Heinrich, King, Weekes and Murphy. Rounding out the Suns weekend roster were Davis Hague, Drew Barsch, Rickie Jeneson, Peter MacMillan and Riley Sibbach. Coach Benson assessed the season so far by saying, "The midget/high school team is doing great. We joined the Boise High School league so we can keep the kids fresh with a game each week. "We started back in mid-October with a couple of losses in the league, kind of had a thin roster due to soccer going to state and a couple of seniors making college visits. Then we got on a little bit of a roll, going 14 games without a loss, had two ties in there. "We won the Qwest High School tourney in early November and won the Utah High School Turkey Shootout over the Thanksgiving weekend. "This past weekend we went 2-2-0, playing our first games of the year against U-18 competition. Our two losses were to the Idaho Falls U-18 squad—a good team, very deep. We dropped the first one 4-2, came out a little flat, then settled down and made it a good game. The other loss was 3-2 in a shoot-out in the championship game. We gave up the tying goal with about four minutes left while we were on a 5:00 power play." Next Suns game is a league affair Friday in Boise.